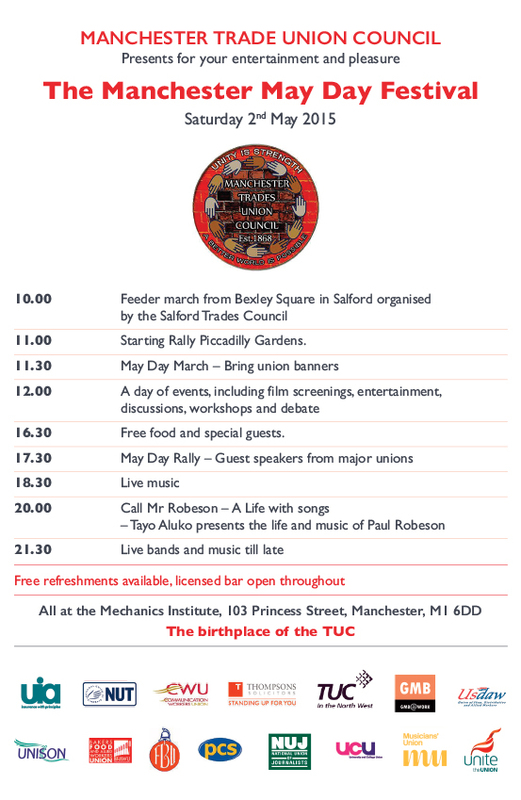 NW UNISON is organising an international zone at the Manchester TUC May day Festival on Saturday, May 2nd at the Mechanics Institute, 103 Princess Street, Manchester M1 6DD. The day begins at 11am with a rally in Piccadilly Gardens, followed by a May Day March at 11:30am (see the leaflet and flyer below for further details). The international sessions will run from 12pm to 4pm in the John Tocher Room at the Mechanics Institute. We have organised four excellent sessions on a range of important international topics. We are delighted to announce a very special guest, H. E. Teresita Vicente, the Cuban Ambassador will be in attendance on the day. The Ambassador will be speaking at the session on Cuba in the International Zone as well as the Festival plenary session. There will be a bar which is open all day along with free tea and coffee, followed by free food from 16:30. There will also be music and entertainment from 18:30. Tickets are required and you can obtain one for free by clicking this link.